Hello and welcome to the 106th installment of the SWD. Syrian Arab Army captured all of the localities north of Maskanah from Islamic State, the latter just withdrew from the area and SAA slowly entered the localities and cleared them of improvised explosive devices left behind by retreating IS fighters. Localities captured today include Wadihah al-Judaydah, Al-Hayet, Khirbat al-Uqla, Al-Mazhara, Mustahira, Khirbet al-Sawdat and Khan al-Sheer. Islamic State reportedly destroyed SAA‘s technical mounted with a machine gun and a tank with two anti-tank guided missiles in the village of Al-Karmah, southeast of Deir Hafir. Yesterday, Syrian Democratic Forces captured some ground from Islamic State southeast of Tabqa Air Base. 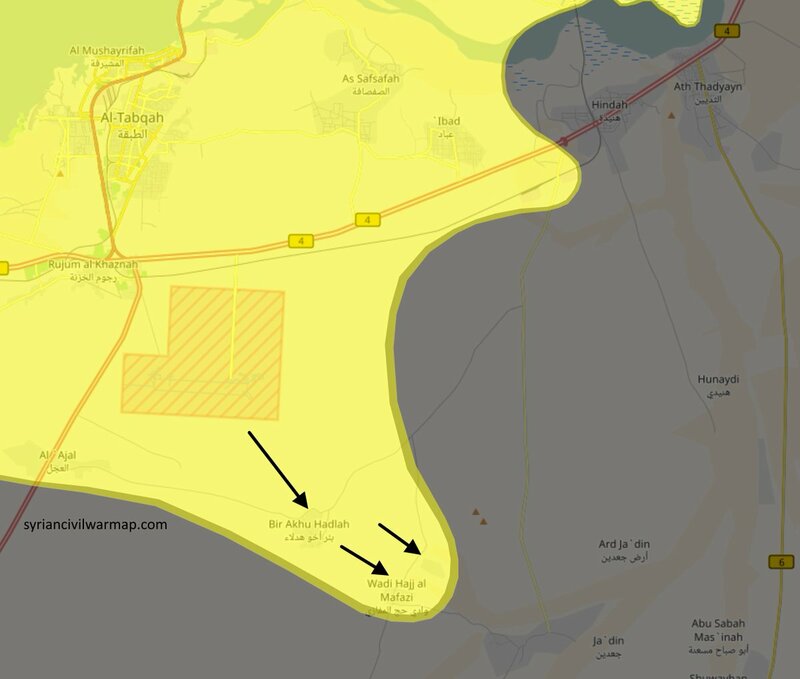 Localities captured by Syrian Democratic Forces are Bir Akhu Hadlah, Bir Hajj al-Mufazi and Bir al-David. Islamic State’s Amaq Agency claimed IS’ improvised explosive device destroyed a vehicle carrying SDF fighters near Jabal al-Anz, southwest of Al-Shaddadi. Hayat Tahrir al-Sham arrested three Free Syrian Army’s fighters at a checkpoint near Maarat al-Numaan, they were accused of fighting in Turkey’s Euphrates Shield operation. One of the three arrested individuals is Ahmed al-Hamoud who joined the demonstrations against Bashar al-Assad in Damascus in 2011. Fourth batch of evacuees left Barzeh neighborhood towards Idlib/Jarablus, the batch consists of around 600 civilians and around 400 rebels carrying ~375 light weapons. Barzeh is now officially under the complete control of Syrian Arab Army. Syrian Arab Army launched an attack around Hawsh al-Dawahirah, clashes occurred with Jaysh al-Islam and SAA didn’t make any advances as the attack was repelled. Jaysh al-Islam claimed 40 SAA soldiers were killed and wounded as they tried to capture Hawsh al-Dawahirah. In west Mosul, Iraqi forces are still clashing with Islamic State in districts north of Old Mosul, the latter is resisting more than anticipated, causing the operations to move at a slower pace. Today’s downing of three Iraqi drones by IS in Al-Najjar district will certainly prolong the intelligence phase of the future attacks in the district. Amaq Agency reported the death of six Iraqi soldiers due to clashes with IS at the outskirts of Al-Saha district. Another statement from Amaq claimed 11 Iraqi soldiers were killed by IS’ snipers in districts of Al-Rifai and Al-Saha and in Bab al-Toub neighborhood, Old Mosul. 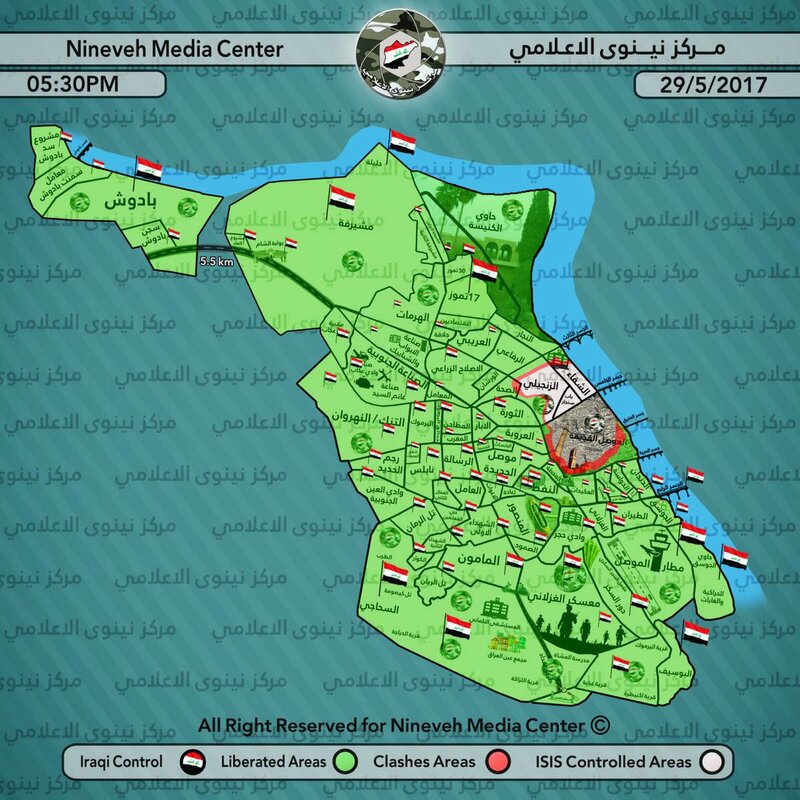 Iraqi Army captured at least nine IS’ VBIEDs in Al-Shafaa district, west Mosul. Al-Hashd al-Shaabi (Popular Mobilization Units) made big advances against Islamic State in western Nineveh governorate, after capturing several villages and a lot of open ground, Iraqi forces reached the border with Syria. Some of the captured villages today are Taro, Wadi al-Midar, Umm al-Theban, Al-Ani, Rijat al-Markab, Qaryat al-Tawm, Qaryat Raqabat al-Fars and Talat al-Markab. President of Munazzama Badr (Badr Organization), part of Al-Hashd al-Shaabi and member of the Iraqi parliament Hadi Al-Amiri reportedly stated that the next phase of the operation is to fully secure Iraqi border with Syria from Islamic State. The operation will start from Umm al-Ajaris, west Nineveh governorate, with an aim to reach Al-Qaim, western Anbar governorate. Amaq claimed IS’ improvised explosive devices destroyed two vehicles carrying members of Iraqi Federal Police in Al-Budhiab area, north of Ramadi. Islamic State’s improvised explosive device reportedly destroyed a vehicle and killed two Al-Hashd al-Shaabi’s fighters in Balad Ruz (Baldrouz). On the 28th of May 2017 CJTF-OIR has conducted 18 strikes in Syria. CJTF-OIR‘s main focus in Syria at the moment is Tabqa-Raqqa-Deir al-Zour region where they did 16 strikes supporting SDF‘s operation against IS destroying nine IS fuel trucks, five IS well heads, an IS oil still, three VBIED facilities, two VBIED factories, three fighting positions, two vehicles an ISIS mechanical facility; and damaged an IS-held building. Other areas where two strikes occurred are Abu Kamal and Al-Tanf destroying three IS well heads and three IS bunkers. Full report on CJTF-OIR strikes conducted in both Syria & Iraq can be found here.